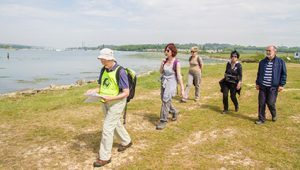 If you’re joining us on the Isle of Wight Walking Festival, here’s some important information to ensure you get maximum enjoyment from the walks. It’s worth reading these properly so that you are prepared for your walk and know what to expect. If you have any medical problems please alert the walk leader of your condition and advise leader of any medication you are carrying (information required in case of an incident). All walkers walk at their own risk and neither Visit Isle of Wight nor their appointed agents and guides can take responsibility for personal injury. The duration of walks is approximate and will depend on group abilities and size. On walks where dogs are welcome they must be kept of a short lead. Extendable leads are not accepted. Car parks – please ensure that your car park ticket is sufficient should the walk run over time. Bus timetable – please log onto www.islandbuses.info for the latest updated bus timetable. Walk leaders reserve the right to refuse participation to any walker if they are not suitably attired or in the leader’s opinion feel they would be unsuitable to undertake the walk. Please wear walking boots or stout shoes with good grips. Grading is given to help you to choose walks that you can enjoy based on your knowledge of your own fitness and agility levels. Walk leaders have given the grade of their routes taking into account the length of the walk, the terrain, any obstacles that will be encountered and the intended pace that will allow the walk to be completed within the time stated. 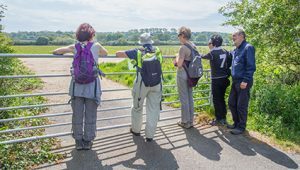 Please ensure that you choose walks that best suit you, so that you and your fellow walkers can fully enjoy them in the way in which the walk leaders have planned. Ability – please ensure that you check the key, and only take part in walks that are suitable for your walking ability. Photography – On occasions a photographer will be sent out to document walks for the use in future promotion of the walking festival. If you do not wish to be included in these photographs, please indicate this to the photographer, who will ensure that you are not in any of the pictures used. Sometimes walk leaders will also take photos for social media and again if you are uncomfortable please make the walk leader aware.